Having lived for centuries, the eternal creature called Apocalypse believes that only the strong can survive. For this reason, he manipulates mutants into battling each other, winnowing out the loser. 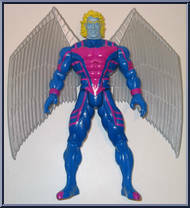 . .
Once the happy-go-lucky X-Man known as the Angel, Warren Worthington’s life was forever changed when the evil mutant Apocalypse destroyed his organic wings and replaced them with cybernetics! N. . .
Few things can match the acrobatic prowess of the Beast, but one of them is his intelligence. For, despite his brutish appearance, the Beast is a genious, who uses both his command of science and his. 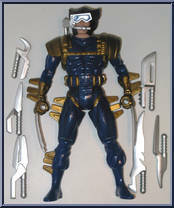 . .
Born in a possible future, the mutant lawman called Bishop traveled into the past on the trail of a mutant criminal. There, he met his heroes, the X-Men, and became one of their number. Now stranded. . . He is master of strategy and cool in combat. His mutant energy is his "Lazer Eye Beams" which he uses to defeat would-be assailants. Armed with the mutant ability to charge an object with explosive kinetic energy, the ragin’ Cajun called Gambit made a living as a thief before he encountered the X-Men. Putting an end to his c. . .
After his interment in a concentration camp, Erik Lehnsherr realized that the only way mutants could survive would be to dominate mankind. Turning his complete control of magnetism to his newfound ca. . .
No one knows the truth about Mr. Sinister! This elusive evildoer manipulates other mutants into participating in his shadowy schemes. Both his true motives and the full extent of his powers are unkn. . . Created during the Cold War to be the ultimate Russian super-soldier, the man called Omega Red, was placed in suspended animation when his soviet masters deemed him too dangerous and uncontrollable. . . . Blessed with unbelievable beauty Rogue is the "Southern Belle" of the X-Men. Beauty, however, isn't her only attribute - she possesses superhuman strength, near-invulnerability, and the abi. . .
Before he was transformed into the Adamantium-bladed super hero called Wolverine, the man named Logan plied his trade as a top secret operative for the Canadian government. His fast-healing ability a. . . When the scientists of the top secret Weapon X project wanted to create the ultimate soldier, they took the savage mutant named Logan and bonded the unbreakable metal Adamantium to his skeleton. But . . . 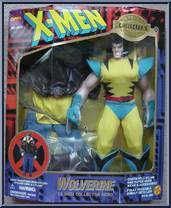 The most feared member of the X-Men, and some would say, the most loyal as well. His razor-sharp claws and his ferocious attitude make his enemies think twice about crossing him! Cyclops is the one member the X-Men count on to hold the team together and create a winning plan when the odds for success seem hopeless. Cyclops’ mutant-energy eyebeams are so powerful that th. . .
Sabretooth is Wolverine’s greatest enemy. Both are products of the top-secret Weapon X program. 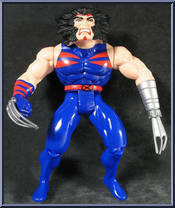 But instead of using his super-sharp claws and fighting abilities for good, Sabretooth became th. . .
Apocalypse is the ruler of America. New York City is now Apocalypse Island, and all humans are sentenced to salvery! Only the most powerful mutants survive to reign alongside the high lord En Sabah . . . When Professor Xavier's son Legion went back in time and accidentally killed him, it changed the course of time and space- altering reality. Not only is the now one-eyed Cyclops the adopted son of Sin. . . 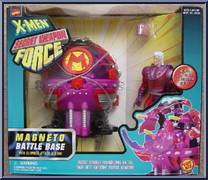 In a different world the X-Men were founded by Erik Lehnsherr, better known as Magneto, the master of magnetism. Although the team roster has changed slightly, their quest for peace between human and . . . Although Sabretooth is usually one of the X-Men's most fearsome foes, in this different reality, he is in fact an X-Man, fighting for peace alongside his former adversaries. And although he still poss. . . 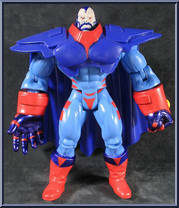 The Age of Apocalypse - a dismal alternate reality ruled by the corrupt vision of a madman. 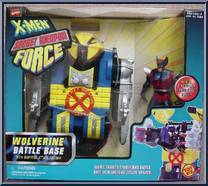 Fighting in the mutant rebellion against the tyranny of Apocalypse is Logan, the mutant berserker known as W. . .